Click here to download a sample of the Mineral Mission Rock Detectives eBook. 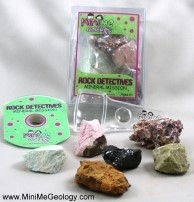 Kids love this kit because of the unique shapes, colors and properties of the minerals and the activities and experiments in the eBook. Teachers love the kit because it teaches experiment testing, deductive reasoning and thinking skills and parents love the kit because it allows them to spend time with their children performing fun experiments while they learn.